They've sung his praises on social networking pages, calling him a "hero," "the greatest man of our time," "a legend." They've said he deserves to be knighted and should be decorated with medals. They've cried out for his amnesty and have even proposed serving time for him. The man many hundreds of thousands of Facebook users honor is no other than Muntadhar al-Zaidi, the Iraqi journalist who was sentenced Thursday to three years in prison for hurling his shoes at then-U.S. President George W. Bush. 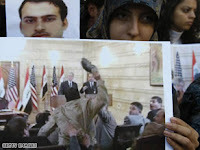 The double-whammy size 10 shoe toss, neither of which hit Bush, took place in December at a news conference in Baghdad, Iraq. In many traditional Middle East circles, throwing shoes at someone is considered a grave insult. To do this to an American president surrounded by Secret Service agents, no less, was as shocking to riveted viewers who watched the footage later as it was to the president himself. "First of all, it's got to be one of the most weird moments of my presidency," Bush said later. "Here I am getting ready to answer questions from the free press in a democratic Iraq, and a guy stands up and throws his shoe. ... I'm not angry with the system. I believe that a free society is emerging, and a free society is necessary for our own security and peace." Expressing their own freedom on Facebook, a worldwide fan base rose up to laud al-Zaidi's actions. They formed hundreds of fan pages and groups, big and small, serious and light. One is even called the "Shoe-Throwing Appreciation Society." Mike Trainor, 28, was watching a football game when a news break brought footage of the incident across his TV screen. "I thought it was the funniest thing I'd ever seen," said Trainor, a Queens, New York, stand-up comedian behind "Guy Who Threw His Shoes at Bush," which has attracted nearly 270,000 fans. The comedian may have created the post for laughs, but he quickly learned how loaded the issue was. "It grew into this crazy thing," in which Bush supporters began to weigh in on message boards calling al-Zaidi supporters "a threat to America" and insults in reaction flew, he said. "It shows people have a lot of passionate feelings about it, that's for sure." One message board on his page, titled "YOU GUYS HATE AMERICA," drew 384 posts in reaction. The creator started it with these words: "seriously you guys are all a**holes. why would you be happy about some freaking foreigner throwing his shoes at the leader of the free world? I don't care if he's dumb he's my president of my wonderful country [sic]." And interspersed amid the groups of fans were those that spoke out against the al-Zaidi worship. "That shoe thrower is not a hero," attracted 94 members, many of them with Arabic names. One London poster said the shoe thrower "did nothing but bring shame upon us iraqis [sic]," and another from Halifax, Nova Scotia added, "I dont care about bush but this guy was very disrespectful to the Iraqi Prime minister who was standing right next to him [sic]." But the shoe-thrower fans, at least in the world of Facebook, seem to far outweigh those who decried his actions. "This site is intended to express the appreciation of those who share the frustration and anger that you expressed when you blew Mr Bush those boot-kisses [sic]," reads the description on "Thank you Muntadhar al-Zaidi," a nearly 500-member page created by a teacher at the University of Auckland in New Zealand. Protests of the journalist's arrest and now sentence brought Arab and Muslim demonstrators to the streets. But what Facebook has shown is that al-Zaidi's angry expression resonated with those beyond his religion and region. From England and Uruguay to China and Bush's own red, white and blue, supporters have made noise, at least virtually. "We're talking about a common man, like me and you," who was "tired of years of lies from a self-called 'freedom saver,' " said Matteo Ferigo of Padova, Italy, the 30-year-old creator behind "Save Muntadhar al-Zaidi," which has 116 members. "I understand that his act was not so civil, polite or 'politically correct,' but I also understand how Iraqi people can see George Bush and what he represents to them." Ari Vais, the creator of the page, "Free the Iraqi shoe throwing journalist!," said his own history taught him the value of free expression. "I was born in the Soviet Union, where dissent like this was cracked down on severely," said Vais, a 39-year-old Queens, New York, musician. "We came to America when I was a boy because we knew that people should be free." What al-Zaidi did was a reflection of the democracy Vais thought Bush intended to spread. "We were supposed to be liberators, and what America stands for is freedom of self-expression and human rights," he said. "All he did was throw a couple shoes. And he missed! It was political theater and not jail-time stuff." But it was serious business. Anyone, no matter where they live, would be tackled by Secret Service and face charges for such an attempted assault on the president. And if al-Zaidi had done this to Saddam Hussein, one has to wonder what would have come of the man who's now celebrated. The shoe throwing, because it was so shocking, proved great fodder for late-night talk shows. Comedians, beyond Trainor, had a field day with this one. It inspired online games for people who wanted to play al-Zaidi. Matt Love of Edmonton, Alberta, in Canada called the Iraqi journalist's move "an act of great courage" and said that in showing his disdain for Bush, "He spoke for many millions of people." The 52-year-old retired Washington state department of transportation worker believes everyone can learn from the shoe thrower. Commenting Thursday on several fan pages, including one calling for a Nobel Peace Prize for al-Zaidi, Love suggested that people turn out for Bush's March 17 speech at the TELUS Convention Centre in Calgary. "Lets [sic] show some solidarity...and lob some loafers," he wrote. "Will the Canadian government lock us up for 3 years? Let's find out." Reached later in the day, however, he assured CNN that this was written tongue-in-cheek. "Let me be clear," Love said. "I won't be throwing shoes at anyone." American Idol Idol: Adam’s Acoustic Comeback! What will the Sun look like when it dies?